Today, we’re featuring a favorite French snack sure to please all your loved ones — Madeleine, also called Petite Madeleine (Little Madeleine). Madeleines are probably the equivalent of chocolate chip cookies in the US in terms of the fond childhood memories it triggers when eating them. 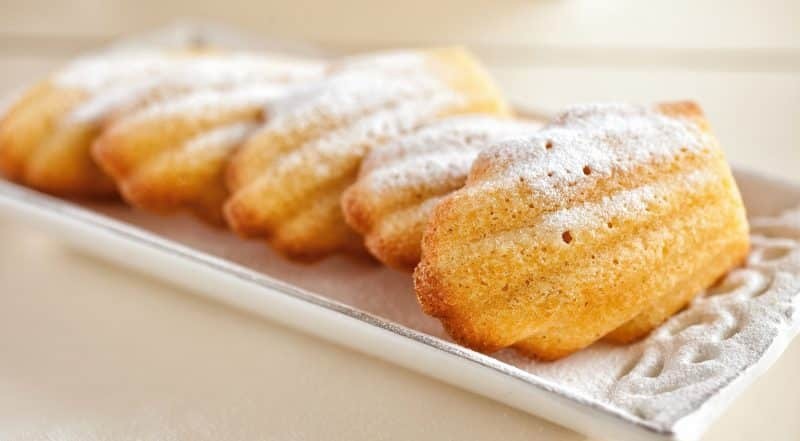 French children are not caught with their hands in the “cookie jar” but rather in the “madeleine tin box.” Madeleines make a wonderful snack for children, delicious treat with an after lunch espresso or to accompany an afternoon tea. Check our detailed (and oh so easy) recipe and Art of the Home suggestions below. Enjoy and bon appétit! Place butter and sugar in mixing bowl. Mix in eggs one at a time at high speed. You want to get a pale yellow mixture. Add baking powder to flour and sift. Add sifted flour on the side of the bowl (3-4 Tbsp at a time) and mix in slowly until all the flour is incorporated and then mix on high speed for about 10 seconds. Repeat until you have used all the flour. Using a paper towel, oil a madeleine pan. Pour in madeleine dough using a kitchen tablespoon and fill in madeleine mold to about 3/4 (see picture below). If time allows, let madeleine dough rest in the fridge, this will give your madeleine that classic hump. 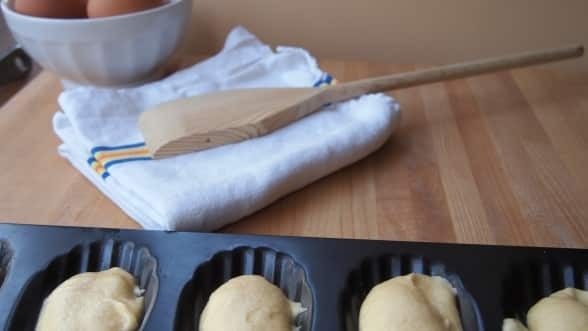 Gently loosen the madeleines using a small silicone spatula or a knife. Place on cooling rack (hump facing up) or plate. Clean and dry madeleine pan. Repeat step 6 and bake the next batch. For chocolate lovers: add in 3-4 chocolate chips on top of the madeleine before putting in the oven. Always a great hit with children! Involve your little chefs: a great cooking activity to do with children. Fancy it up: dust with confectioners sugar on top. Great snack: in a school lunch box or wrap one up and put it in your purse for an afternoon craving! Leftover Madeleines: best preserved in a tin box. Madeleine is also an old fashion French name. In the video below (with English subtitles), heartbroken Jacques Brel is waiting for his sweetheart “Madeleine” that never arrives.